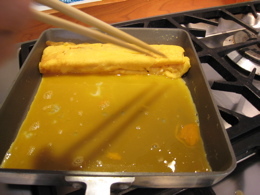 Tamagoyaki or Japanese rolled egg omelette made in a rectangular frying pan is usually the last course at sushi bars due to its sweetness. It’s also a regular ingredient in bento boxes, and appears in the traditional nori roll. You will need a rectangular frying pan for this, but you can use your ingenuity with a circular pan. It’s not really hard, just make sure you adjust the heat so you don’t burn the omelette, and the rest is in the wrist action. Recipe: Mix dashi (100cc), sugar (2 tablespoons), mirin (1.5 tablespoons) salt (a little) and soy sauce (a little) in a saucepan and bring to boil to dissolve solids. Allow to cool in fridge before mixing with about 5-6 eggs. Use chopsticks for this, don’t overbeat. Line a tamagoyaki pan very lightly with oil (this is important). 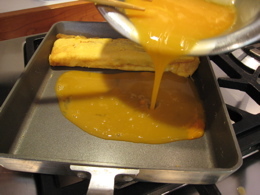 Pour a little egg mixture into the warm pan and as it cooks, fold the thin omelette about 4 times to make a roll. Line pan with oil again, mix well egg mixture (as it will separate) and pour into pan, lift the roll to let the mixture underneath. 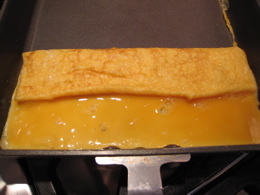 Roll the omelette back towards the other end of the frying pan, making a thicker omelette. 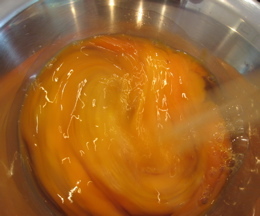 Continue to do this until all the mixture is gone. You should have a rectangular thick omelette with neatly squared edges. For the final touch, roll up in a bamboo rolling mat to perfect the shape and allow to cool.